Transcription factors are proteins that regulate gene expression by modulating the synthesis of messenger RNA. Since this process is often one dominant control point in the production of many proteins, transcription factors represent the key regulators of numerous cellular functions, including proliferation, differentiation and apoptosis. Pancreatic cancer progression is characterised by activation of inflammatory signalling pathways converging on a limited set of transcription factors that fine-tune gene expression patterns contributing to the growth and maintenance of these tumours. Thus strategies targeting these transcriptional networks activated in pancreatic cancer cells could block the effects of upstream inflammatory responses participating in pancreatic tumorigenesis. 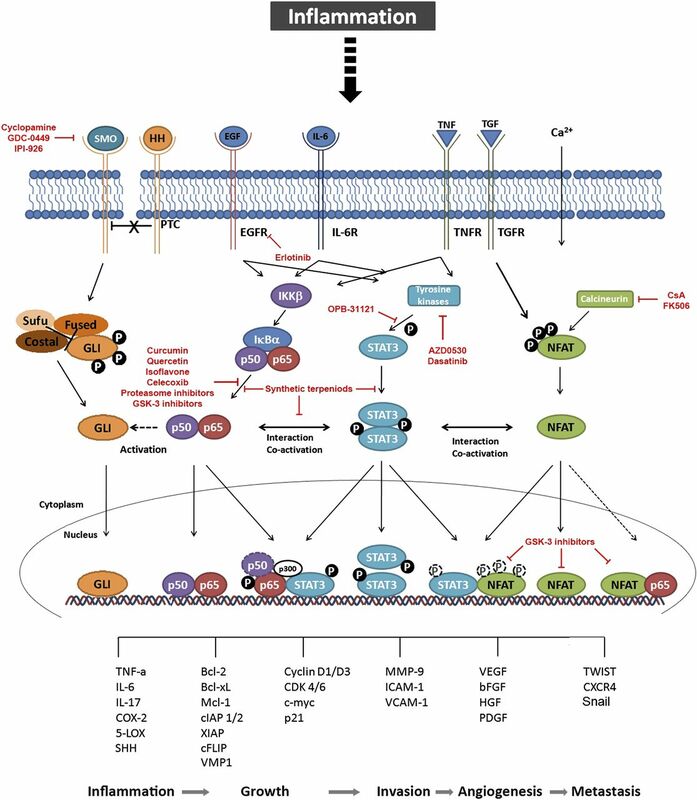 The authors review this field of research and summarise current strategies for targeting oncogenic transcription factors and their activating signalling networks in the treatment of pancreatic cancer. Pancreatic cancer, one of the most devastating malignancies, is triggered by genetic and epigenetic alterations leading to the aberrant activation of key oncogenes and inactivation of tumour suppressor pathways, and consequently confers transforming cells with a growth and survival advantage over normal cells. The most common genetic abnormality in pancreatic cancer is the activating mutation of KRAS, which is an initial key event in pancreatic carcinogenesis and found in virtually all invasively growing tumours.1 However, mutation of KRAS alone is not sufficient for full neoplastic progression, and additional abnormalities (eg, deletions of tumour suppressor genes) and signals that originate from the tumour microenvironment are required for tumour promotion and progression.2 ,3 The tumour-associated microenvironment comprises stromal cells (mainly fibroblasts and stellate cells), endothelial cells and cells from the innate (eg, macrophages, neutrophils, dendritic cells and natural killer (NK) cells) and adaptive immune system (T and B lymphocytes), which can act in an autocrine and/or paracrine manner to trigger tumour progression. It is now apparent from epidemiological, pharmacological and genetic studies that chronic inflammation can stimulate pancreatic cancer progression through extensive cross-talk interactions between malignant epithelial cells and the surrounding microenvironment.4–6 Accordingly, recent pathological studies suggest that the establishment of pancreatic precursor lesions (PanINs) and the progression to frank adenocarcinoma occurs in most, if not all, cases in the presence of chronic inflammation and is associated with secretion of large amounts of proinflammatory cytokines, growth factors and proteases such as tumour necrosis factor (TNF) α, interleukin (IL) 6, Hedgehog (HH) and transforming growth factor (TGF) β. These cytokines activate an oncogenic network of transcription factors in pancreatic cancer cells leading to tumour growth, survival and invasion4–6 through the regulation of a specific set of target genes (figure 1). Below we will discuss some of the factors regulated by inflammatory cascades, especially those activated in tumorous cells. Putative cross-talk between oncogenic transcription factors contributing to pancreatic carcinogenesis. Inflammation induces binding of cytokines and inflammatory ligands to their receptors, which in turn activate the corresponding transcription factor signalling pathways. Binding of HH to the transmembrane protein PTC reverses the inhibitory effect on SMO, which again releases GLI transcription factors from their inhibitory complex and finally initiates nuclear translocation. The activation of the pathway can be blocked by inhibitors of SMO such as cyclopamine and its derivatives currently in clinical studies, GDC-0449 and IPI-926. Interactions with the NFκB signalling pathway are illustrated by the dashed arrowhead, which indicates activation of the HH pathway mainly through the regulation of the expression of its ligand SHH. Binding of EGF or IL-6 activates IKKβ kinase, which stimulates degradation of IκBα. Subsequently, NFκB proteins are released to the nucleus, where they mediate gene transcription alone or in cooperation with STAT proteins. Curcumin, quercetin, isoflavone and proteasome or GSK-3 inhibitors interfere with NFκB signalling mainly through inhibition of NFκB activation. Thereby, p-STAT3 binding to p-p65 induces histone acetyltransferase p300 and retains active p65 in the nucleus. Synthetic terpenoids can either block isolated NFκB and STAT3 activation or inhibit the interaction of both pathways. A putative binding of p50 to STAT3 is shown by the dashed circle. The STAT3 signalling pathway can also be activated by the aforementioned inflammatory stimuli. Upon binding of the ligands to the transmembrane receptors, (receptor-bound) kinases, such as JAKs, SRC or ABL, are activated and in turn phosphorylate STAT3 proteins. EGFR inhibitor, erlotinib, as well as tyrosine kinase inhibitors, AZD0530 and dasatinib, have been shown to efficiently block STAT3 activation. The subsequent dimerisation leads to nuclear translocation and target gene transcription, partially by interaction with NFAT transcription factors. The interaction on target promoters is not dependent on STAT and NFAT phosphorylation, illustrated by dashed circles. The canonical NFAT signalling pathway is activated by intracellular Ca2+ increases leading to activation of the phosphatase calcineurin and dephosphorylation of NFAT proteins, which shuttle to the nucleus and bind to their target promoters. Calcineurin inhibitors, CsA and FK506, block NFAT dephosphorylation and nuclear translocation. NFAT phosphorylation does not exclude nuclear localisation and binding to partner proteins, shown by dashed white circles. The dashed arrow indicates a possible interaction with p65, which has been demonstrated for other non-pancreatic tissues. GSK-3 inhibitors successfully disrupt NFAT binding to partner proteins such as STAT3 as well as NFAT transcriptional activity in the nucleus. Finally, the network of inflammatory transcription factors regulates numerous target genes mediating inflammation, growth, invasion, angiogenesis and metastasis, thereby contributing to pancreatic carcinogenesis. Bcl-2/xL, B cell lymphoma 2/xL; bFGF, basic fibroblast growth factor; CDK 4/6, cyclin-dependent kinase 4/6; cIAP 1/2, cellular inhibitor of apoptosis; cFLIP, cellular FLICE (FADD-like IL-1β-converting enzyme)-inhibitory protein; COX-2, cyclo-oxygenase-2; CsA, cyclosporine A; CXCR4, CXC-motif chemokine receptor 4; EGF(R), epidermal growth factor receptor; GSK-3, glycogen synthase kinase-3; HGF, hepatocyte growth factor; HH, Hedgehog; ICAM-1, intercellular adhesion molecule 1;IKKβ, IκB kinase β; IκBα, inhibitor of NFκB α; IL-6(R), interleukin-6 (receptor); JAK, janus kinase; 5-LOX, 5-lipo-oxygenase; Mcl-1, myeloid cell leukaemia sequence 1; MMP-9, matrix metaloproteinase 9; NFAT, nuclear factor of activated T cells; PDGF, platelet-derived growth factor; PTC, Patched; SHH, Sonic HH; SMO, Smoothened; STAT3, signal transducer and activator of transcription 3; Sufu, Suppressor of Fused; TGF(R), transforming growth factor (receptor); TNF(R), tumour necrosis factor (receptor); VCAM-1, vascular cell adhesion molecule 1; VEGF, vascular endothelial growth factor; VMP1, vacuole membrane protein 1; XIAP, X-linked inhibitor of apoptosis protein. The transcription factor NFκB, a master regulator of innate immunity and inflammation, represents a molecular bridge between chronic inflammation and cancer development.7–9 In fact, there has been increasing interest in its role in both inflammation-induced carcinogenesis and maintenance of established cancer, where it is constitutively activated.10 The NFκB family comprises five members, which form homodimeric and heterodimeric complexes: RelA (p65), RelB, Rel (cRel), NFκB1 (p50 and its precursor p105) and NFκB2 (p52 and its precursor p100). Activation of these proteins is regulated by the canonical NFκB activation pathway which applies to RelA/p50 dimers, which are sequestered in the cytosol through interactions with inhibitory proteins of the IκB family. After stimulation by inflammatory cytokines such as TNFα, IκB is phosphorylated by the IκB kinase (IKK) complex, leading to their ubiquitylation and subsequent degradation by the proteasome pathway. RelA/p50 dimers are then translocated into the nucleus, where they activate the transcription of growth-promoting genes (eg, cyclin D1, cyclin E, CDK2 and c-Myc) as well as cytokines (eg, IL-6) (figure 1). NFκB has been shown to be constitutively activated in pancreatic cancer, where its inhibition enhances the sensitivity of cancer cells to chemotherapeutic agents and death receptor-mediated apoptosis. In addition, NFκB helps to control proliferation, cell survival and invasion of pancreatic cancer cells11 ,12 induced by inflammatory stimuli originated from the microenvironment. Recently, it has been reported that tyrosine phosphorylation and activation of the STAT3 transcription factor is stimulated by the transcription factor NFATc1, another oncogenic factor with key roles in gene regulation during pancreatic carcinogenesis.24 NFAT factors together with NFκB belong to the extended NFκB/Rel family of transcription factors and thus share structural similarities of their DNA-binding domains, also known as Rel homology regions (RHR). The canonical mode of DNA binding by the RHR has been well characterised in the structures of several NFκB–DNA complexes, and it becomes clear that NFAT can bind to several promoters with κB sites.25 NFAT proteins modulate inflammatory processes and participate in the regulation of genes influencing cell growth and differentiation. In resting cells, NFAT resides in the cytosol and in a hyperphosphorylated form. A rise in intracellular calmodulin-bound Ca2+ levels activates the heterodimeric phosphatase, calcineurin, which dephosphorylates multiple serine residues in the NFAT N-terminal region, resulting in rapid translocation of the protein from the cytoplasm to the nucleus, where it enhances local chromatin acetylation and promotes de novo gene transcription.26 Similarly to NFκB and STAT3, ectopic activation of individual NFAT members is now recognised as an important aspect of oncogenic transformation in many different human malignancies including pancreatic cancer. In these tumours, sustained activation of the Ca2+/calcineurin/NFAT signalling and transcription pathway has emerged as a multifunctional and powerful regulatory principle governing growth and survival of transformed cells.26–28 Expression and constitutive activation of two members of the family, NFATc1 and NFATc2, is found in PanIN-2 lesions and in the nuclei of most of the invasive tumours. NFAT-dependent cell growth and transformation through c-Myc promoter activation in pancreatic cancer requires interaction with the ETS-like transcription factor, ELK-1.26 ,29 ,30 Similarly, NFAT forms promoter-bound transcription complexes with NFκB and STAT3 in pancreatic cancer cells in a signalling-dependent manner, promoting cellular functions associated with pancreatic cancer development and progression (unpublished work). Other key oncogenic factors implicated in pancreatic cancer and activated by inflammatory cytokines are the members of the GLI family (GLI1, 2 and 3),31–43 which regulate the expression of genes important for tumour microenvironment (IL-6),33 cell proliferation (CDK2),34 apoptosis (bcl-2) and autophagy (VMP-1) (Fernandez-Zapico ME, personal communication, 2011.). These zing finger proteins were originally identified as downstream effectors of the HH signalling pathway31–37 (figure 1), a cascade that is activated during pancreatic inflammatory processes and carcinogenesis. As downstream effectors of HH, the GLI factors are activated via two multi-transmembrane proteins: Patched (PTC) and Smoothened (SMO). In this receptor complex, PTC is the ligand-binding subunit, while SMO represents the signalling component. Upon binding of HH to its receptor (PTC), the inhibitory effect of PTC on SMO is released, and signal is triggered leading to the activation of GLI proteins.31 ,32 HH-driven pancreatic tumours are mainly characterised by inappropriate ligand expression, in particular Sonic HH and Indian HH, which is overexpressed in pancreatic tumours, both in mice models and human tumours.34–37 Interestingly, GLI activation by the HH ligands seems to be exclusively increased in stromal cells, suggesting an important contribution of the tumour microenvironment to paracrine GLI signalling in pancreatic carcinogenesis.31 ,36 ,37 These observations may be of therapeutic relevance since pharmacological inhibition of HH–GLI signalling in a mouse model of pancreatic cancer enhances chemotherapy delivery.38 There is an emerging body of experimental work highlighting the role of GLI in pancreatic carcinogenesis independently of HH.38 ,39 Recent reports demonstrate that KRAS regulates GLI activity by increasing GLI1 expression and protein stability and cooperates with GLI2 during pancreatic carcinogenesis.39–41 Other studies have found that GLI factors are regulated in pancreatic cancer cells through a SMO-independent mechanism by TGFβ.39 Activation of this signalling pathway leads to an increase in expression of both GLI1 and GLI2 in pancreatic cancer cells.42 Hence, numerous lines of evidence support a role for GLI proteins in pancreatic cancer and suggest that this family of transcription factors is a suitable therapeutic target for this dismal disease. Surgical resection to date represents the best therapy for long-term survival in pancreatic cancer. At diagnosis, however, only 15% of the patients are amenable to surgical resection43 and alternative treatment options mostly fail because of resistance to chemotherapy or radiation.44 Currently, the only approved treatments are gemcitabine and erlotinib, both of which are not effective in the majority of patients and, most notably, the benefit on survival is measured in weeks.45 On the basis of the central role and intensive cross-talk of inflammatory transcription factors in signalling networks aimed at maintaining the transformed phenotype in pancreatic cancer, these nuclear molecules represent suitable nodes for therapeutic intervention. In the following paragraph, we discuss a few examples of current studies aimed at inhibiting the activity of these oncogenic transcription factors and their target genes in pancreatic carcinogenesis (figure 1 and table 1). To date, there are no effective strategies to directly target a transcription factor,46 rather the discussed compounds target upstream signalling pathways to block the activation of the respective transcription factor and its signalling. The genetic knockdown of NFAT remarkably reduced in vivo tumour growth of pancreatic cancer cells.29 ,30 Two widely used immunosuppressive agents, cyclosporine A (CsA) and FK506, act as potent calcineurin–NFAT inhibitors. Their use in cancer therapy is limited, however, because of large side effects and the fact that long-term application is accompanied by increased incidence of cancer. Consequently, a tumour-targeted therapy is required. Several inhibitors structurally and functionally related to CsA and FK506 that exhibit fewer side effects have been developed, but remain to be tested in terms of efficacy, stability and bioavailability in preclinical tumour models.27 Nonetheless, small-molecule inhibitors of NFAT are preferred for clinical use. Further strategies to block NFAT activity in pancreatic cancer include targeting of endogenous activators of NFAT, such as glycogen synthase kinase-3 (GSK-3) (unpublished work). Recent studies revealed that the inhibition of GSK-3 kinase activity disrupts STAT3–NFAT interaction and consequently reduces NFAT transcriptional activity and cell growth in pancreatic xenograft mouse models. Moreover, it acts to stabilise NFAT protein and accordingly enhances oncogenic NFAT functions (unpublished work). GSK-3 is also a potent modulator of NFκB activity in gastrointestinal cancers. Several authors have confirmed the abrogation of NFκB activity and target gene transcription upon pharmacological GSK-3 depletion in mouse models of pancreatic cancer.60 ,61 Since chronic inflammation represents a risk factor for the development of pancreatic cancer, inflammatory pathways should be considered as critical therapeutic targets. Notably, GSK-3 regulates the transcription factors, NFκB, STAT, NFAT and possibly GLI, in different cells present within the tumour microenvironment.62 As these transcription factors also correlate with inflammatory responses, they emerged as potential drug targets in inflammatory diseases. Inflammation is often linked to carcinogenesis, and therefore these proteins primarily represent key modulators of inflammatory processes promoting cancer development. This renders GSK-3 an interesting tool for repressing (inflammation-mediated) carcinogenesis. The use of chemical HH–GLI pathway inhibitors, such as cyclopamine and its derivatives, in clinical trials (GDC-0449 and IPI-926) demonstrates a reduced tumour burden and metastasis in mouse models.36–39 ,63 Furthermore, the effect of an SMO antagonist on the efficacy of chemotherapy was recently analysed in a genetic mouse model of pancreatic cancer. Interestingly, delivery and efficacy of gemcitabine could be improved, which was mainly mediated through depletion of tumour-associated stromal tissue. These findings most notably indicate a contribution of the HH–GLI pathway to inflammation-linked chemoresistance.36 It has also been shown that NFκB directly regulates HH expression in a model of inducible NFκB activation in pancreatic acinar cells. Therein, genetic silencing of HH significantly reduced the IKK2-mediated increase in in vivo tumour growth, which suggests an intense interaction between NFκB and HH signalling pathways in oncogenesis64 and supports the rationale of a combination therapy targeting these two oncogenic pathways in pancreatic cancer. In summary, oncogenic transcription factor proteins are powerful molecules involved in the regulation of cell proliferation, differentiation and apoptosis. Furthermore, these factors have been demonstrated to play an important role in the pathogenesis of pancreatic cancer. Although direct interference with the activity of transcription factors would represent the most specific strategy, it remains a challenging and, moreover, a unidirectional task46 because of intensive cross-talk of inflammatory transcription factors. As numerous oncogenic and inflammatory pathways converge on these factors, the targeting of central upstream regulators, and subsequently the complete network, appears feasible. This, in contrast with isolated chemotherapy, could block the effects of multiple pathways that contribute to malignancy. Targeting transcription factors such as NFκB or STAT3 that moreover mediate resistance to apoptosis13 and chemoresistance,65 a common feature of pancreatic cancer, would offer a favourable option. Nonetheless, there are still limitations for the application of the aforementioned drugs. At this time, some display low bioavailability and, as a consequence, low tumour tissue levels in vivo.50 As STAT3, NFκB or NFAT factors exert global effects on functions and development of immune cells, efforts to suppress inflammatory signalling could nevertheless affect immunsurveillance and in turn tumour-suppressive responses on long-term application. Thus, understanding the role of transcription factors in modulating gene expression and pancreatic carcinogenesis mainly in terms of inflammation will lead to more effective clinical tools for diagnosis, prognosis, treatment and prevention strategies for this dismal disease. Table 1 summarises current and closed clinical trials evaluating inhibitors of NFκB, STAT3 and GLI transcription factors in the treatment of pancreatic cancer. We thank Angela McCleary-Wheeler and Gaurav Aggarwal for critical reading of the manuscript and helpful advice. This work was generously supported by the Deutsche Forschungsgemeinschaft (to VE: KFO210, SFB-TR17), the LOEWE-Schwerpunkt ‘Tumour and Inflammation’ (to VE) and the Max-Eder program of the German Cancer Research Foundation (to VE: 70-3022-El I), Novartis Foundation (to VE), Schulze Center for Novel Therapeutics (to MEF-Z), Mayo Clinic Cancer Center (to MEF-Z), the National Institutes of Health CA136526 (to MEF-Z), Mayo Clinic Pancreatic SPORE P50 CA102701 (to MEF-Z), and Mayo Clinic Center for Cell Signalling in Gastroenterology P30 DK84567 (to MEF-Z).
. Inflammation and pancreatic cancer: an evidence-based review. Curr Opin Pharmacol 2009;9:411–18.
. The role of nuclear factor kappaB in pancreatic cancer and the clinical applications of targeted therapy. Pancreas 2008;36:225–35.
. Primers on molecular pathways. The glycogen synthase kinase-3beta. Pancreatology 2007;7:398–402.
. NF-kappaB/Rel transcriptional pathway: implications in pancreatic cancer. Int J Gastrointest Cancer 2002;31:71–8.
. NF-kappaB as a critical link between inflammation and cancer. Cold Spring Harb Perspect Biol 2009;1:a000141.
. NF-kappaB promotes epithelial-mesenchymal transition, migration and invasion of pancreatic carcinoma cells. Cancer Lett 2010;295:214–28.
. Downregulation of nuclear factor-kappaB p65 subunit by small interfering RNA synergizes with gemcitabine to inhibit the growth of pancreatic cancer. Cancer Lett 2010;291:90–8.
. Stat3 and NF-kappaB activation prevents apoptosis in pancreatic carcinogenesis. Gastroenterology 2002;123:2052–63.
. IKK/NF-kappaB and STAT3 pathways: central signalling hubs in inflammation-mediated tumour promotion and metastasis. EMBO Rep 2009;10:1314–19.
. NF-κB and STAT3—key players in liver inflammation and cancer. Cell Res 2011;21:159–68.
. STATs in cancer inflammation and immunity: a leading role for STAT3. Nat Rev Cancer 2009;9:798–809.
. Persistently activated Stat3 maintains constitutive NF-kappaB activity in tumors. Cancer Cell 2009;15:283–93.
. Inflammation and oncogenesis: a vicious connection. Curr Opin Genet Dev 2010;20:65–71.
. Inflammation and cancer: IL-6 and STAT3 complete the link. Cancer Cell 2009;15:79–80.
. Stat3/Socs3 activation by IL-6 transsignaling promotes progression of pancreatic intraepithelial neoplasia and development of pancreatic cancer. Cancer Cell 2011;19:456–69.
. Deregulated NFATc1 activity transforms murine fibroblasts via an autocrine growth factor-mediated Stat3-dependent pathway. J Cell Biochem 2009;108:237–48.
. NFAT and NF-kappaB factors-the distant relatives. Int J Biochem Cell Biol 2004;36:1166–70.
. Primers on molecular pathways—the NFAT transcription pathway in pancreatic cancer. Pancreatology 2010;10:416–22.
. NFAT proteins: emerging roles in cancer progression. Nat Rev Cancer 2010;9:810–20.
. NFAT, immunity and cancer: a transcription factor comes of age. Nat Rev Immunol 2010;10:645–56.
. Overexpression of c-myc in pancreatic cancer caused by ectopic activation of NFATc1 and the Ca2+/calcineurin signaling pathway. EMBO J 2006;25:3714–24.
. NFAT-induced histone acetylation relay switch promotes c-Myc-dependent growth in pancreatic cancer cells. Gastronenterology 2010;138:1189–99.
. Hedgehog signaling and gastrointestinal cancer. Biochim Biophys Acta 2010;1803:786–95.
. Context-dependent regulation of the GLI code in cancer by HEDGEHOG and non-HEDGEHOG signals. J Mol Cell Biol 2010;2:84–95.
. GLI2 mediates cytokine crosstalk in the tumor microenvironment. J Biol Chem 2011;286:21524–34.
. Hedgehog signaling and therapeutics in pancreatic cancer. Carcinogenesis 2011;32:445–51.
. Hedgehog is an early and late mediator of pancreatic cancer tumorigenesis. Nature 2003;425:851–6.
. Paracrine Hedgehog signaling in cancer. Cancer Res 2009;69:6007–10.
. Hedgehog signaling is restricted to the stromal compartment during pancreatic carcinogenesis. Proc Natl Acad Sci U S A 2009;106:4254–9.
. GLI1 is regulated through Smoothened-independent mechanisms in neoplastic pancreatic ducts and mediates PDAC cell survival and transformation. Genes Dev 2009;23:24–36.
. Hedgehog/Ras interactions regulate early stages of pancreatic cancer. Genes Dev 2006;20:3161–73.
. Induction of sonic hedgehog mediators by transforming growth factor-beta: Smad3-dependent activation of Gli2 and Gli1 expression in vitro and in vivo. Cancer Res 2007;67:6981–6.
. Pancreaticoduodenectomy: a 20-year experience in 516 patients. Arch Surg 2004;139:725–7.
. No standard treatment is available for advanced pancreatic cancer. Eur J Cancer 1995;31A:882–7.
. Liposome-encapsulated curcumin: in vitro and in vivo effects on proliferation, apoptosis, signaling, and angiogenesis. Cancer 2005;104:1322–31.
. Inhibition of NFkappaB and pancreatic cancer cell and tumor growth by curcumin is dependent on specificity protein down-regulation. J Biol Chem 2010;285:25332–44.
. Food-derived polyphenols inhibit pancreatic cancer growth through mitochondrial cytochrome C release and apoptosis. Int J Cancer 2010;98:761–9.
. Phase II trial of curcumin in patients with advanced pancreatic cancer. Clin Cancer Res 2008;14:4491–8.
. Molecular evidence for increased antitumor activity of gemcitabine by genistein in vitro and in vivo using an orthotopic model of pancreatic cancer. Cancer Res 2005;65:9064–72.
. Synthetic triterpenoids prolong survival in a transgenic mouse model of pancreatic cancer. Cancer Prev Res (Phila) 2010;3:1427–34.
. Sulindac inhibits activation of the NF-kappaB pathway. J Biol Chem 1999;274:27307–14.
. The angiotensin-I-converting enzyme inhibitor enalapril and aspirin delay progression of pancreatic intraepithelial neoplasia and cancer formation in a genetically engineered mouse model of pancreatic cancer. Gut 2010;59:630–7.
. Nuclear factor kappa B activation is a potential target for preventing pancreatic carcinoma by aspirin. Cancer 2005;103:2485–90.
. Clinical update: proteasome inhibitors in solid tumors. Cancer Treat Rev 2003;29(Suppl 1):41–8.
. RNA interference-mediated signal transducers and activators of transcription 3 gene silencing inhibits invasion and metastasis of human pancreatic cancer cells. Cancer Sci 2007;98:1099–106.
. Antitumor effects and biomarkers of activity of AZD0530, a Src inhibitor, in pancreatic cancer. Clin Cancer Res 2009;15:4138–46.
. Combined blockade of Src kinase and epidermal growth factor receptor with gemcitabine overcomes STAT3-mediated resistance of inhibition of pancreatic tumor growth. Clin Cancer Res 2011;17:483–93.
. Glycogen synthase kinase-3beta participates in nuclear factor kappaB-mediated gene transcription and cell survival in pancreatic cancer cells. Cancer Res 2005;65:2076–81.
. Maintenance of constitutive IkappaB kinase activity by glycogen synthase kinase-3alpha/beta in pancreatic cancer. Cancer Res 2008;68:8156–63.
. Innate and adaptive immune responses regulated by glycogen synthase kinase-3 (GSK3). Trends Immunol 2010;31:24–31.
. Hedgehog inhibition prolongs survival in a genetically engineered mouse model of pancreatic cancer. Gut 2008;57:1420–30.
. Characterization of sonic hedgehog as a novel NF-kB target gene that promotes NF-kB mediated apoptosis resistance and tumor growth in vivo. FASEB J 2009;23:21–33.
. Role of NF-kappaB and Akt/PI3K in the resistance of pancreatic carcinoma cell lines against gemcitabine-induced cell death. Oncogene 2003;22:3243–51.